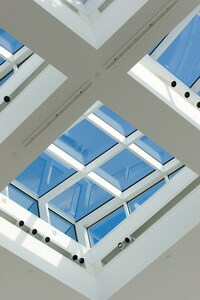 Skylights are the most practical and economic solution to lighting problems. Aside from providing an additional natural light resource, skylights are aesthetically attractive and can add beauty and design to ones building. 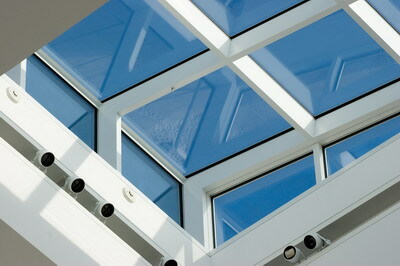 Pyramid skylights are in the same way suited to commercial and industrial applications. Pyramid skylights are, as the name suggests, pyramid shaped, and are able to enclose large rooms where shelter is required, yet lighten them up to their fullest extent. Such spaces can include passageways, atriums, interior patios, canopies, sunrooms, greenhouses, walkways, and plenty more. 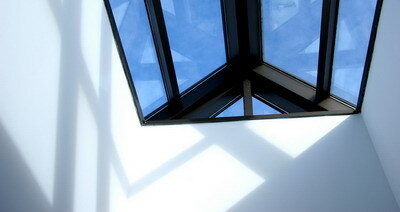 Pyramid skylights can be 4 sided or multi faceted. This is important because it allows you to choose your desired lighting effects and aesthetic design, to suit your building or office space. Also, pyramid skylights can be adapted to a range of pitches and sizes, each able to cater to various needs. In order to inquire what kind of pyramid skylight is most suited to your building and needs, contact your nearest Roof 101 branch to have a contractor come and inspect your roof. Our pyramid skylight inspection and installation services are of the highest quality, and are backed by years of unbeaten experience. Usually, commercial pyramid skylights are designed uniquely for your building, not only to accommodate all your described needs, but also to provide a distinctive look for your building. For this you will need to get in touch with a pyramid skylight manufacturer, yet our expert roofers can pass you on to someone reputable after having inspected your roof.